Like any card-carrying ID doctor, I enjoy teaching about antibiotics. Give me a whiteboard (small group), or a PowerPoint set-up (lecture hall), and I’m off and running. Not surprisingly, an important theme of these talks revolves around avoiding antibiotic overuse. Over the years, I’ve collected a few egregious examples of how marketing distorts public perception of antibiotics — and, in particular, their indications. These images are fun to show in my talks — and, quite explicitly, to mock. Free Antibiotics! Just in time for “Cold and Flu Season!” How generous! “Very, very strong antibiotics” for someone who “sneezed.” Brilliant. Those strong antibiotics will be just the thing. 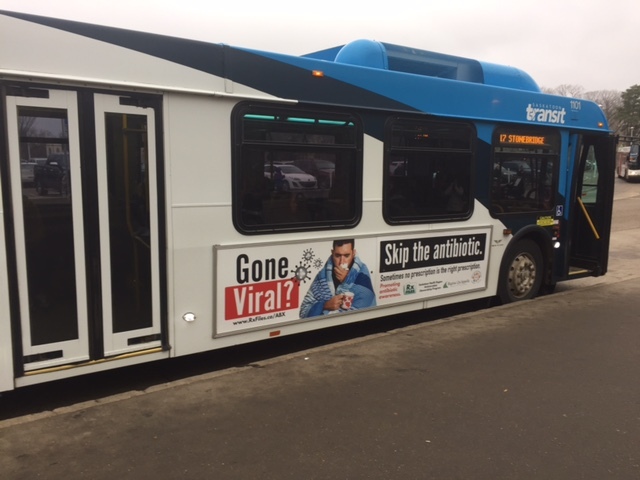 Let me state the obvious — these ads reinforce the very wrong belief that people with viral respiratory tract infections benefit from antibiotics. This misconception drives much of the inappropriate antibiotic prescribing in outpatient care and emergency rooms. By showing the images, I’m hoping to demonstrate just how pervasive these incorrect views are. It’s a brief and entertaining (I hope) diversion from the more didactic parts of the talk. Ugh. Standard 4.3, of course! But here’s a question for the ACCME folks — doesn’t the context of these images matter? This usage is hardly promotional. It’s just the opposite, I’m making fun of these ads. And here’s a second question — do you think we live in an advertising-free world? Wouldn’t the learners’ education be furthered by seeing examples of how misleading commercial claims can be? One of the two courses relented when I made my point — slides stayed in. The other one, no such luck. I’m taking my revenge out on this inexplicable ruling by posting the images here. Here in Saskatchewan, Canada, we made a push with our academic detailing program (the RxFiles) to put some counter advertisements on buses. We also put some posters together for family docs to hang up in their offices. (Link here: https://www.rxfiles.ca/rxfiles/uploads/documents/RxFiles-ABX-Public.htm). Love the viral prescription pad. Says it all, says it perfectly! I’m with you, Paul. The ads should stay in. And “New Hoo Hoo Math” is, as you say, brilliant! The subway ad especially makes me cringe. I can’t stand hearing about “strong” or “big gun” antibiotics and try to discourage this verbiage at every opportunity. How many times have other providers and even patients suggested that vancomycin should be continued for a streptococcal infection or a beta-lactam-susceptible Staph because it’s a big gun? Alex, I love your adverts. They are great. Hi Ed, thanks and great to hear! 1. There are 5 importantly medical microbes: prions, viruses, bacteria, fungi, parasites. 2. There are 5 attributes of an infectious disease: anatomy, etiology, complication, immunocompromise, comorbidity. Hey Paul, thanks for sharing. I’m an internist working in urgent care. From my experience, as long as basic education is provided, and a non-antibiotic med to speed symptom improvement is given, 95% of pts thinking they’re going to receive Abx are fine not receiving them. Anyone can use their own creativity to develop such a strategy. I’ve shared this with my PAs and Abx usage has gone down tremendously, no complaints from patients. It only takes a few seconds to counter the horrible adverts. Dr. Prasad is my new hero, thanks to point #2 on his list. 🙂 Who invented the concept of “teaching objectives” in PowerPoint slides, anyway? Substituting a non antibiotic but symptomatic treatment is fantastic. I spent two years practicing Pediatrics on the North Shore in a practice with a male OB and a male internist. Most of my patients were Polynesians and had never seen a white person with blue eyes. My Korean parents were sure they were superior because whites and women knew nothing. I tried to carefully write out my recommendations because I knew some of the fathers would not do would I had recommended or fill the prescriptions until the child had seen the MALE OB. He would read what I had written, make the same recommendations, and the children would usually get better. There were not alternative medicine people to deal with but there were sometimes grandmothers who did cupping. I did not give families choices about immunizations. My parents did not have computers (1981-1983) there was no internet. I live in Austin, Texas which has a number of mothers who elect for personal reasons not to immunize their children. However, children must be immunized to enter PUBLIC school. Children in charter schools, some church schools or who are home schooled do not have to be immunized. There is a bill in the Texas Legislature to loosen the rules on who must be immunized for what. I am a native Texas and I live in a sometimes stupid and short-sighted governed state. Love the article and Tom Lehrer ‘s song, but the illustrator should check his spelling. It’s “you’re”, not “your”. Or is that the “new orthography”? I grew up in the pre-antibiotic era. (born in 1943) A girl down the street, I remember her name, died during the measles epidemic that gave me life-long immunity. There were dozens of people with polio, some died. Others wore braces on their legs or were confined to bed on a “shell” respirator. My uncle lost hearing in one ear due to a strep infection. My high school counselor had Parkinson’s Disease most likely due to the 1919 Flu epidemic. The anti-vaxx people and many younger doctors have never seen or experienced these illnesses or seen them in patients. While in practice I had patient in labor who had chickenpox. Fortunately we were able to acquire an experimental anti-varicella globulin to give to the newborn. This passive immunity probably saved his life. While in Cambodia for 15 years I gave a number of courses of rabies vaccine. Something I never had to do in the US. Fortunately the new vaccine (Verorab) is safer and better than the older one. Same is true of the new Vaccine (IXIARO) for Japanese Encephalitis. We must encourage the proper use of antibiotics. We can treat viral illnesses, if possible, and promote vaccines to prevent them. I had dengue; it was not fun. I had patients with malaria and hepatitis C for which there are no vaccines. Doctors must resist giving antibiotics for minor URI’s. Like the old adage says “a cold lasts seven days with antibiotics and a week without them”.